We've gone from snow to endless rain here - little Dudley just nips out into the garden whenever necessary and scoots back indoors for a quick rub down with a towel! He's not a wimp of a dog but I don't think he's keen on regular soakings either, and I don't blame him. The past couple of weeks have been such a wonderful time with Darnell's brilliant blog hop that she set up to celebrate seven years of yours truly running the Snippets Playground. I've been amazed and totally delighted by the wonderful things you've been saying, by your lovely snippets cards and also by quite a few arriving here through the post as well! I truly can't thank you all enough for your immense kindness and the (blush) wonderful things you've said. And another huge thank you to Darnell of course! Emma T is going to be a source of much inspiration for you girls I think! She hasn't been playing with us for too long but has totally embraced the idea of using up loads of little snippets, even before she came to play with us! Isn't this shaker jar of explooding butterflies wonderful? So many of you commented on Emma's card and I know it was a huge hit with you. So much so that we now have that same butterflies die in the Toy Box, patiently waiting its turn. I'll be using it differently but you have to wait and see just how! Do please take your *Gold Star* award from the RH side bar Emma - and well done! I love it when Playmates use their prizes and then link up a snippets card - and Sandra H just did exactly that, using the 'Noel Word Antlers' die she recently won in the Playground. 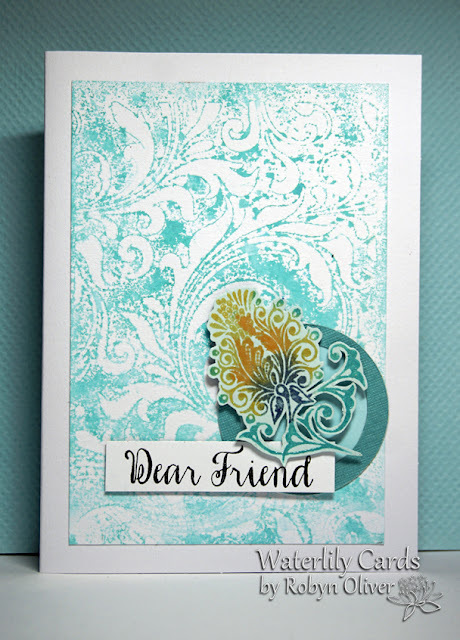 Love the soft shades of the patterned paper and am pretty sure it's LOTV. I just adore this card, made by Margaret. Wonderful use of snippets and it really is like a splash of Summer - I love gingham and the bright and fresh flowers are gorgeous! 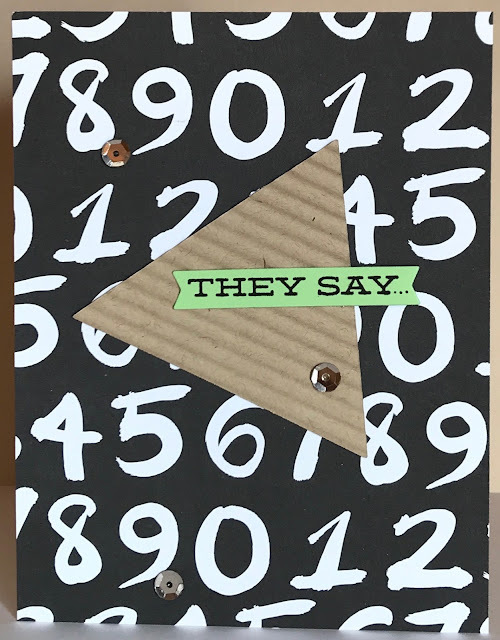 I predicted we'd have a few innovative ways to use snippet strips recently - and Jeanne came up trumps with this wonderful card, for the thank you blog hop (mwah!). 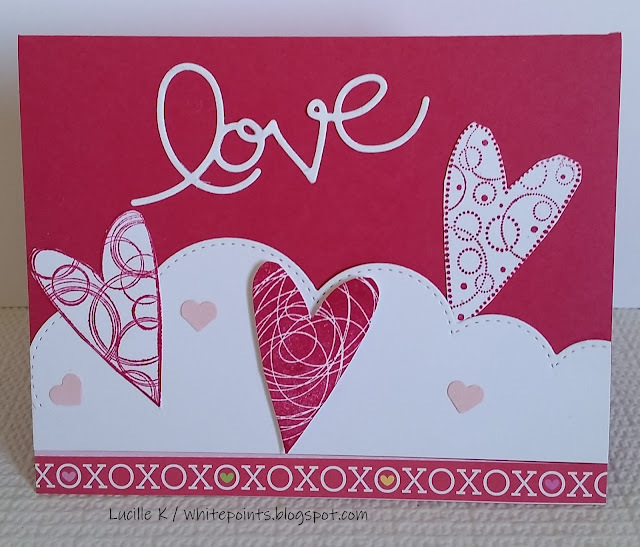 I totally love the interwoven strips with the die cut sentiment! Funny enough I need to make a Birthday card for a neighbour's little boy and want to keep it clean and not too specific - my own attempt at this design will, with luck, appear here before too long! Welcome to the Snippets Playground girls and what a wonderful selection of cards - hope you all come back and play really soon. 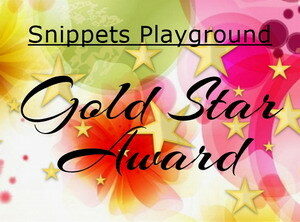 Including the five new Playmates we had a total of 67 entries - brilliant! Do please send me your address Andrea, with full name at the top as well so I can copy and paste or just write straight from the email onto the envelope - for speed and ease. It's also confirmation that you still would like the prize of course and I'll post your prize once I hear from you. Please put Playground Winner or similar in the subject line of your email in case it drops into my junk mail. Email address is on RH sidebar as always. Actually, I'll post the prize off to you as soon as one of us can get to a post box - right now I can't get a shoe on, let alone drive! After three years respite, it's 'Return of the Gout' - playing at a cinema near you. It diddled around for most of last week and then last night and now today (Saturday) decided to go into full blown 'now I'm gonna make you really suffer and scream for England' mode so am typing this laid up in bed using my baby pink laptop. I know it will pass so long as I keep taking the pills and rest it a bit whilst it's at the peak - if this ain't the peak then you might well hear the roars over where you live! Remember folks, there's still almost another week to run on Challenge #345 - you can find it HERE. The prize is a Woodware 'Smile On My Face' stamp and a Woodware 'Time to Wine Down' set of stamps. Hope you all have a lovely week ahead, I don't have any great plans (just as well!). Dudley is happy to keep me company and is never far from my side right now, bless him. Little tinker got into the craft room while Len was out at archery this morning - he was merriily trotting to and fro bringing the waste bin contents into our bedroom, a bit at a time, until I realised what was going on. But, other than that he's been as good as gold - and is currently out with Len for a nice long walk. See how they both have the peachy colouring on their ears? Needless to say Dudley The First is normally kept well out of reach of Dudley The Four Legged Chewing Machine! Psssst, Dudley The First is on the right wearing a red bow tie, grin. And I'm still pondering over Dudley's 'bangs/fringe'. A lot of the time when he's out walking or racing around being a puppy it sweeps back but it just isn't parting enough to frame his sweet little face and keep those eyes uncovered when he's 'stationary'. Ouch!! Take it easy. My hubby had gout years ago and I'm hoping it never returns. 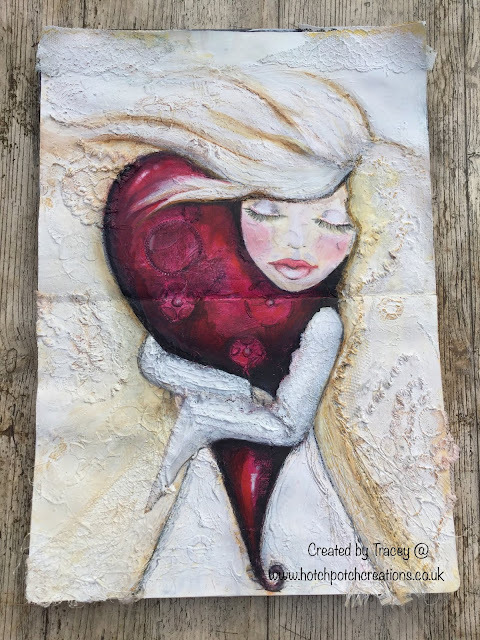 You have chosen lovely projects to feature here. I do hope you feel better soon. Good for you to rest while recovering. ps. This is how rumors get started! I just proofed my comment and noticed that you were attacked by a goat. I'm going to leave it and see if anyone notices, lol! Hahaha . . . chuckling at Darnell's comment about the goat attack! Hope you make a speedy recovery from it mate. 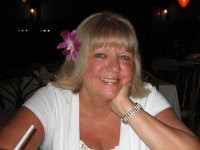 Congratulations to Andrea on her win. Thanks for the pupdate photo! I'm glad you enjoyed the blog hop and reading all of our comments! Lovely picks again this week Di and Emmma is a well deserved Gold Star. NOT the dreaded gout. Oh, I feel your pain and pray it gets better sooner..........much sooner than you expect. How cute Dudley the first is. Not quite as cute as Dudley the 2nd. I say cut the bangs. But then again, I want my bangs cut and I'm scared if I do I'll be sorry and it'll take an eternity to grow out. The picks are fabulous and Emma's card is so deserving of a gold star. 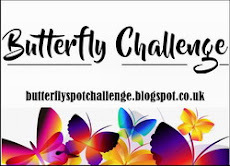 It was great to see new Playmates joining in and Darnell's blog hop showed just how much all your hard work in running the challenge is appreciated by everyone. Beautiful picks and how wonderful to have brand new players. Dudley #1 is so cute and Dudley #2 is the perfect companion to him. Better to keep #1 put up though. I've had gout (or goat) and it is one of the worst things to have. I'm sending you healing thoughts for it to subside quick. It is so painful. SOOOO MUCH BEAUTY! Sorry about the Gout! :( Heal fast!!! Your picks truly deserve gold stars this time. LOVE the butterfly shaker jar, and the other ideas are completely CASE-worthy as well. And the meeting of the Dudleys is so sweet. Oh goodness--a photo to frame, for sure! Love seeing that sweet bundle of fluff! The butterfly card definitely caught my eye & congrats to all the picks! 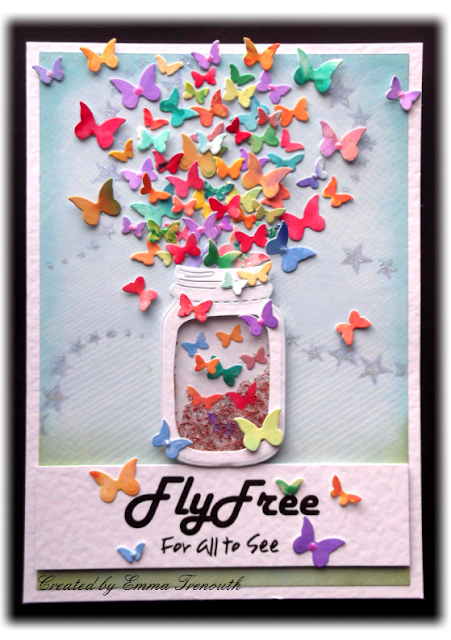 Wonderful collection of picks this time and that flight of little butterflies certainly deserves the gold star - for having probably the most snippets on one card at least and it is so pretty too of course. What a thrill to see my thanks card shown! Thanks so much, Di. So fun to see new visitors to your challenge. You sure deserve all the praise. So sorry to hear you are laid up in pain. Sending a soothing hug to you, Dudley, and Parsnip. Congrats to Andrea and to the top pick! Emma well deserved the gold star, love her stunning card! So sorry instead for your pain, I wish it go away soon! The Dudleys make me smile sooooo much!!! :D How cute!! Great post Di, some really super picks and great to have so many new entrants. Sorry to hear about the 'Return of the Gout', made me smile as it really does sound like an advert for a film. I have a door stopper in my craft room but it is an owl but there is noway I will be getting an owl. Hope you get well PDQ. Love the picks, and pix of the double Dudsters, but definitely not your gout! Wow sorry Di re the gout.. no fun!! Pray recover soon! I'm loving the playmates picks.. clever lot.. and hope you've dry sunshine for all of you over there. Thank you so much Di, what a lovely surprise on my first play day. So many talented creators with those snippets. Sorry to hear about the return of the gout but it's good to know Dudley is keeping you company. 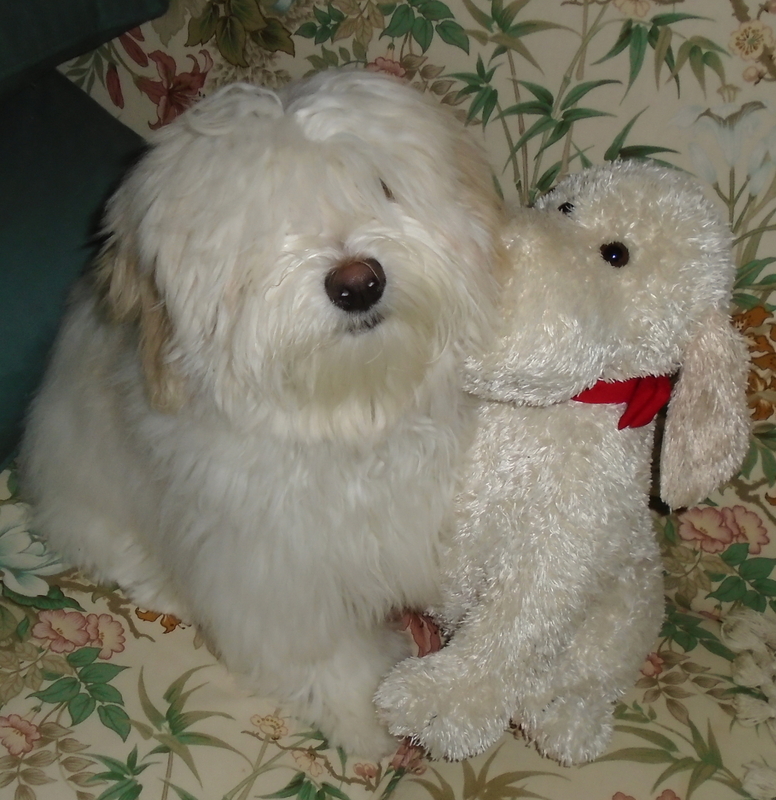 I had to look twice at the photograph as I could have sworn he was giving the other Dudley a cuddle hee hee!! Take good care of yourself and make the most of putting those feet up. 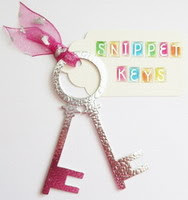 Creative wishes and hope to have some snippet play time very soon. Ouch! I am lucky enough not to have ever suffered an attack of gout but my brother and uncles both have and they say it's miserable. Take it easy while you recover, and make sure that Len keeps Dudley in line so that he isn't a terror once you're back on your feet! Of course, it would be so hard to discipline that adorable little pup, with a face like that (under his bangs..haha!). Our Toby's bangs never parted, so I had to cut them short so he could see. As he's got some poodle in him as well as Maltese, his fur has gotten curlier as he's aged, so it would have gotten frizzy and huge if I didn't keep him clipped shorter. As for the top picks...oh my goodness but Emma's card is beyond amazing! Not only was this a wonderful way to use snippets, but it's such a spectacular card in itself! I've gone over to her blog to subscribe so I can enjoy the rest of her projects as well. Congratulations to all the winners and top picks! Such a fun selection of featured cards, Di. I'm sorry I did not have time to join in the blog hop celebrations. Sometimes I wonder why there are only 24 hours in a day. Sorry to hear you were attacked by a goat (if I have to believe Darnell LOL). Hope you are starting to feel better by now. Sorry Di, I thought I had left a comment here...but obviously not! Sorry to hear you’re feeling poorly, it sounds very painful. I hope things are improving now. Great selection of cards as always! Take care of yourself.